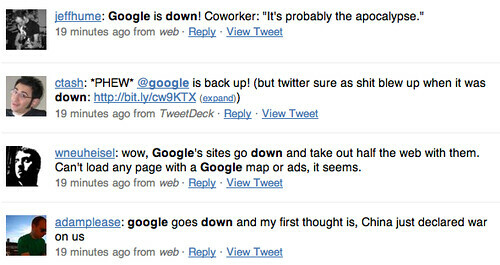 Google went down sometime around 3pm (EST) for many people. I know it was down for me in New York and if you look at tweets around that time for [google down] you will see hundreds of people saying the same thing. See that spike? Spikes like that do not lie. Update: A day later, Google admitted they were down. Google's Rubie said, "yesterday around 12:00 PST, a small percentage of users had intermittent access to Google that lasted about 20 minutes."